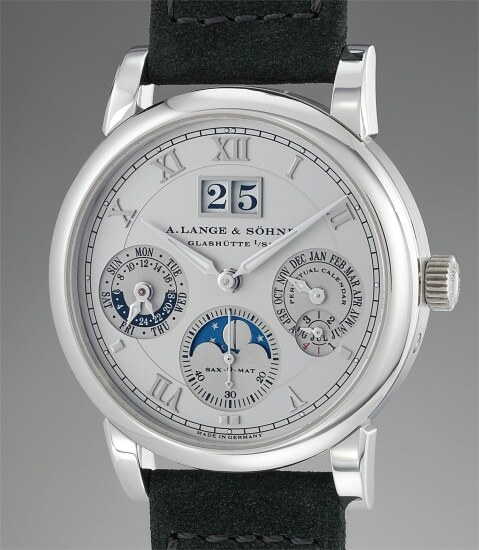 Reference 310.025E is one of Lange & Söhne’s interpretations of one of the most classic, useful and sought-after horological complications: the perpetual calendar. The most noticeable feature of the model is the presence of the large date windows at 12, a “signature” characteristic of the brand. The rest of the information is arranged with supreme elegance around the 3 subsidiary counters: the one at 3 o’clock shows the month and features a smaller subdial for the leap year cycle, the one at 6 shows the phase of the moon and the constant seconds, and the one at 9 indicated the day of the week and the 24 hours indication. The final result is a dial which conveys the complexity of the movement without resulting unencumbered with superfluous information, the sign of a true masterpiece of design. Offered in excellent condition and with all of its original accessories, the present watch will delight its new lucky owner for years to come.